At Spectrum Signs, our policy is to design graphics for our customers that will do the job for which they are intended, whether it is to promote sales, advertise an event, display products, or design a brand. All of our designers are a deeply passionate about their craft, they realise the importance of good communication with our clients, and that they depend on us to produce excellent results. We apply this way of thinking to every project we design, from the smallest sign to the largest shopfront sign, van wrap or banner. Cost to our customer is minimised due to our experience, because collectively, we have a wealth of great ideas that are ready to turn into reality. Our signmakers and installation crew are equally experienced and dedicated. We always choose the correct materials for the job, and our products and installations are always carried out with durability and safety in mind.We look forward to working with you on your projects, in the meantime, here are some Testimonies from happy customers! At Murphy’s Law gastro pub, we offer a great all-day hot food menu. I decided to use vehicle graphics on our van to advertise the food aspect of my business. I discussed options with Paul in Spectrum Signs, and he advised me on what way it should be done to give the best results. The completed graphics were way above my expectation, and it began to pay off from day one. 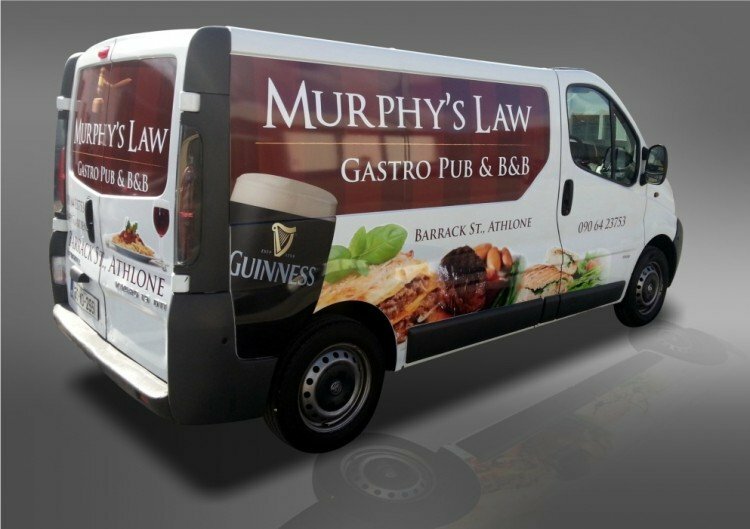 Our food business continues to grow, and many of our customers still mention that they were unaware that we served food until they saw it advertised on our van. A great return for a small investment! 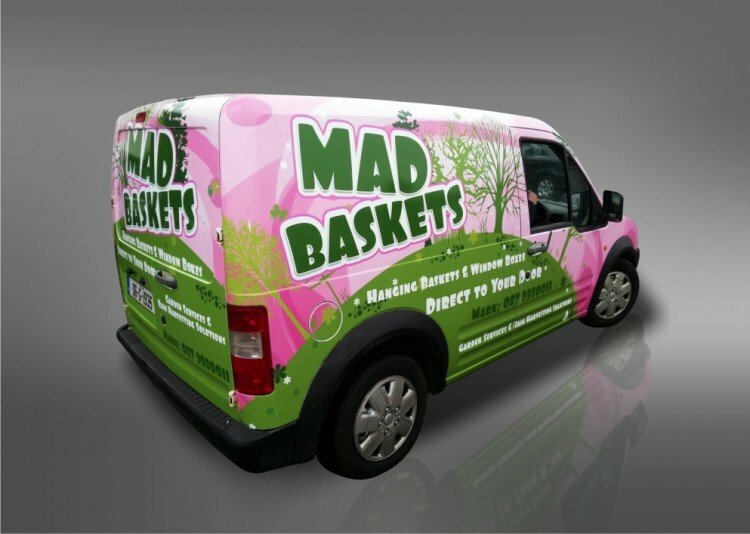 Mad Baskets is a small independent business selling plant containers and window boxes to businesses and households. A friend advised me to call to Spectrum Signs. Because my products are bright and cheerful, I asked them to reflect this in my van graphics, and boy was I wowed! My van is so eye catching that people take pictures of it! Whenever I am working in a neighbourhood, I can always be sure that it is a conversation starter in neighbouring households. This frequently leads to more sales and referrals. My van is a moving billboard, way better than newspaper advertising! We have been doing business with Spectrum signs for many years now and find their service second to none. 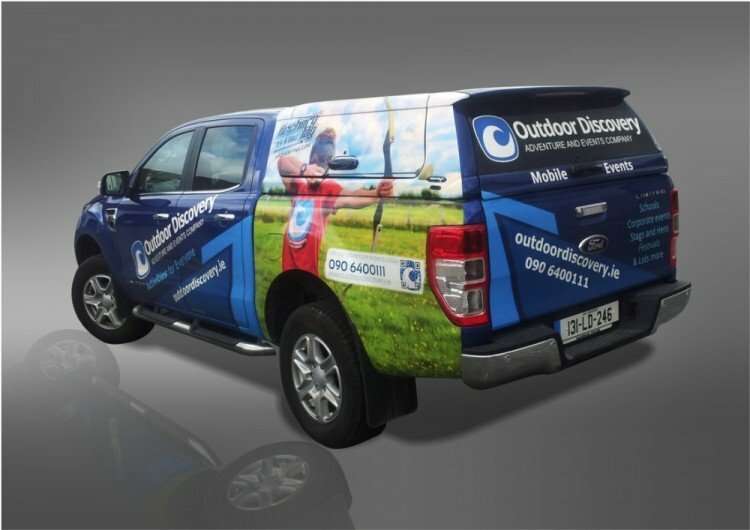 From the design and art work for our building signage to sandwich boards to the body wrap for our company cars we are always impressed with the professional and affordable service we receive at Spectrum Signs. I opened my business in May 2010. I had a lot to do to get the show of the road. I gave Spectrum brief instructions and they took the matter from there. I am very pleased with my signage and all was done with little fuss. This is a great company who get on with things. I have contracted Spectrum Signs for various projects for over 12 years, their consistent creativity and enthusiam for the work is very impressive, which always leads to a quality product. Their extensive services and expert staff are to be highly recommended. Spectrum Signs are a dynamic, progressive and professional company with a great range of products/services on offer coupled with attention to detail and great customer care. Would have “no hesitation” in recommnending this company. Spectrum work excellent work for us producing a very high level of signage, both indoor and outdoor along with vehicle signage, the are a very professional company producing excellent signage and more. We have used Spectrum Signs on a number of occasions in the past and would have no hesitation in recommending them – they are both efficient and cost-effective (both particularly important in the current environment). We have worked with Spectrum signs over the years and always find them not only competitive but also TOP for responsiveness and customer care. I won’t even try to explain how quick and helpful they are as it is simply incredible – see for yourself. I have used Spectrum Signs on several occasions and they provide high quality and excellent service.